Big power, privilege, influence and rewards. Just four of the benefits of my role. So why did I quit four weeks ago, and walk away into a career ‘wilderness?’ What was the REAL reason I resigned? Okay- here’s the truth, and stuff the consequences. I lived in Adelaide in my early 20s, in a house next to a very senior, 80 year old Anglican Church minister. He was about to have a major operation, and was nervous about it. I was chatting to him over the fence: “Oh well, if it goes wrong I guess you’ll find out whether what you’ve been banging on for about for 60 years is actually true!” To his credit, he saw the humour in it, and laughed. That’s why I quit my job. I needed to ‘walk the talk.’ It was time to take my own medicine. Quite simply, I had to have the courage to take this one critical step. And I did. I took the ‘exit’ door when I did not know where the stairs would take me. 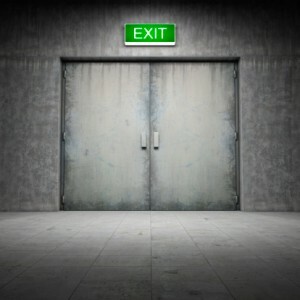 Many people die in emergencies because they refuse to take the ‘exit’ door. They fear the uncertainty of where those stairs lead, and stay put. With the encouragement of family, I walked through it. I had been editing selected previous Possums stories into a book. They reminded me of passionately felt advice I have encouraged readers to take. It was time for me to take my own counsel. I was unhappy in my role. The learning and passion had slowed. For six years it had been the best role I’d ever had, and a privileged part of my career. I’m grateful for the opportunity. But it was time to move on. As I said in my previous Possums post, ‘there’s no growth in your comfort zone.’ I was cruising. I loved the monthly pay cheque, and the ‘pointy end’ pace. It was not enough. I had to walk through that exit door. I’m following my plan of having ‘100 cups of coffee.’ That’s a hundred meetings to just chat about business, life, the universe and everything. Twenty of those meetings will lead me to other conversations which will lead to the five key connections that deliver the perfect ’next step’ for me. I know what I do next ‘will become apparent.’ I have a clear direction, and know final clarity will evolve, and then appear. I have to be free and ‘available’ for the fullness of opportunity to emerge. While I don’t know exactly where those stairs are going to take me, I do have absolute faith it will be to ‘safety.’ Mind you, it’s not all plain sailing. Read here my post on The Five Biggest Learnings I have had so far from quitting my job. I’ve always been a massive fan of ‘making the grass greener on this side of the fence.’ Work hard to adjust a role to give it what is missing for you. If that’s not possible, don’t be a prisoner of cash flow, and fear. Not when you are unhappy. Have courage. Have faith. Of course make sure you plan carefully, particularly financially, and have contingencies in place. Then- take the ‘exit’ door. Good things WILL come from it. Brilliant Chris, and congratulations. As you know, I took your advice over a year ago now and have never looked back. I feel so alive! Congratulations Chris. All the best. Great post Chris! I know exactly how you feel. Good for you! I love the idea of 100 cups of coffee. I think I’ll adopt it. Good luck in the next stage! Looking forward to more Possums posts. So how did the Minister’s operation turn out? Thanks Margaret. He lived ! Presuming you won’t starve to death (! ), I applaud your ‘move’. You have to change, venture into new territory, take risks to spark creativity and fulfill your talents. Congratulations on your move! Hey Chris, bravo for taking your own advice. But please don’t give up your blog in any new role, you have found a niche. In the spirit of continuous learning we need to be operating outside our comfort zone, that’s were the gold is to be found and I know myself to be guilty of this. Breaking through the barriers of fear and cashflow cover the two biggies for many of us. Taking a leaf out of Jim Collins’ principles, you might consider finding your next BHAG to guide you on your journey. Best of luck, just go for it, life is too short. The day that I saw you had resigned my first word was fantastic! Throughout your posts over the last 6 months I felt you were certainly imparting great advice but there was also a distinct feeling that you weren’t quite happy. Having been through it myself, I was almost waiting for it to happen. Stepping into the unknown and doing the things that truly make you happy is invigorating. I’m looking forward to seeing the next giant leap. Hi Chris, Big FEAR to you. The acronym that is. Reflect on your staggering Accomplishments and Focus with new found Energy. You will rock it. Walking the talk is one of the most powerful and inspiring action you can take. During this ‘finding the perfect next step’ phase – can I suggest some travels? Pop over to Perth – instead of a coffee catch-up – let’s do lunch, my shout. Very timely for me to read this. Congrats on having the courage, instinct and passion to make the move! I resigned last week – life is too short to be unhappy in a workplace – surviving a day is just not enough! Good luck Chris – looking forward to following your wisdom in the next stage of your journey. Thanks Karen. Good luck to you! It will become apparent Chris – but thats already taken…. Catch you soon. True Phil. But how about Apparrentt? As always, great post. I walked out on a job after reading Wrestling Possums and thought you might’ve done the same after reading The Long Road 🙂 I look forward seeing what’s ahead. Just done the same – although in my case wasn’t altogether voluntary – Frightening and exhilarating (perhaps more so at 50)- creating a new path with those “100 cups of coffee”and “not allowing oneself to be a prisoner of cash flow” – are great ways to remind me of the path and that it is the right and best way to go for me. Thanks for the post……. Congratulations! First time I’ve replied but have been reading your posts back in London for 4 years and always get much needed inspiration. This was the right thing and I look forward to hearing where it takes you. Enjoy. Hey Chris, whilst this came as a big surprise in some ways, it didn’t in others. I wish I’d read your 5 massive lessons 8 years ago when I did the same thing…I didn’t have guardrails, just got out one day, but I was lucky in some ways that my ‘punch in the face’ was being forced to work my 6 months notice which I had not planned for. In that time I thought about next steps – something I should have done way beforehand – in the knowledge I had a short term safety net but the clock was ticking. That said, as you say one has to overcome that fear of the unknown and resigning at that point was the best thing I ever did in my career. It kickstarted important stuff in my life and at the agency I resigned from, including its subsequent sale which I handled, which wouldn’t have happened otherwise. My career totally changed as a result – from being COO of a big agency (not as big as STW mind!) to helping others grow and exit their businesses. I have no qualms whatsoever that you will have no regrets and a very bright, more varied and less restrictive future awaits you. Well done. And if you come to London, the team would all love to see you here. I’m so excited for you! And keep blogging – the book is a great idea. I love your words of wisdom! I wish you all the best Chris. It will be the right decision I have no doubt. Congratulations on making the leap to your next adventure. Bold move? Of course! Badly needed? Sure sounds like it. A wise one? Hell yes!! Complacency kills creativity and one’s spirit as well. I faced the same situation years (and years) ago. Dreamed my dream and have been living it ever since. If you come stateside for a cup of coffee, holler. I’ll buy. This is what I want to do! Unfortunately I don’t have any residual finances available to quit and hope for the best to happen with my dreams. How do you pinpoint a dream, give up on security and “cash flow” that is vital (albeit from a job making you unhappy and feeling trapped) and follow it to happiness and hopefully wealth?- This is my goal also and I hope I too get there. Don’t stop the blogs because they are thought provoking and inspiring. Good luck with your coffee meetings and plans. Congratulations Chris, as one door closes there will probably be many more that open. I echo everyone’s request to keep the blog going, it’s inspiring and breath of fresh air! We two alone will sing like birds i’ th’ cage. As if we were God’s spies. King Lear- I love this piece even if it is spam! Chris, years ago I took the option to leave Ogilvy for similar reasons. We have met, some time ago and I enjoy your writing. When you come to Melbourne to have coffee with Suzie please can you add me to your list too! Wishing you well, and good on you for sharing your experience at this time. I took a very similar step ten years ago and have had a colourful journey since then,,,no regrets and lots of learning and experiences. Happy to share notes any time. I’ve finally caught up to the fact you resigned. A bold move indeed, and one that would be taken only by someone who is truly passionate about their work. All the best with finding a new job that truly extends and satisfies you. I suggest it be with something small and agile, rather than a giant organisation that can’t help but take on some of the characteristics of an elephant! Well done Chris – I’ve throughly enjoyed your Blog insights! We first met in 1999, let me know when you’re in Melb next and lets catch up to compare possum stories and destinations! It’s been over a year since I’ve read your posts Chris; since I quit my job and didn’t subscribe with my personal email! That’s been rectified now, don’t worry! Isn’t it funny that I’ve come back to your blog to find that you’ve done the same. I’m now on a new adventure to pursue my passion of helping others get healthier and happier, and I wish you the best of luck in your new pursuits too. Til next time..
Great work!! Here’s to coffee #1!